Tell me, which alternative fosters a better understanding of your life experience: the bare bones truth, or an embellished, "flavored" version of the truth that contextualizes you life as a great story, one with heroes and villains, winners and losers, and a beginning...and inevitable end? Tim Burton's 2003 fantasy masterpiece, Big Fish beautifully and emotionally makes the case for the latter option. In real life, we're each of us but a little fish (only 1 out of 7 billion...) swimming about in a global sea. But in our imaginations -- and in our private family circles -- we're all big fish: colorful personalities who loom large in the stories of our sons and daughters, and our Moms and Dads. In our private worlds, we're important, nay the most important figures. 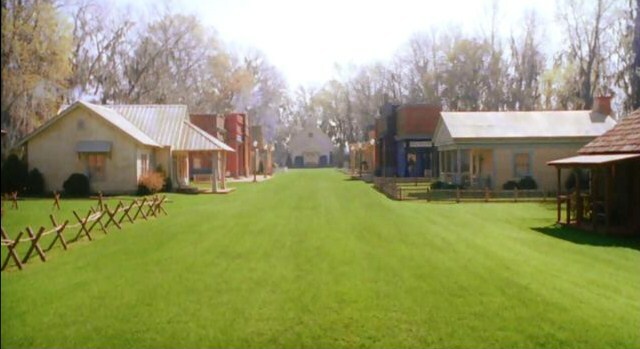 The first shots and compositions of Big Fish take the viewer down into the sun-drenched water of a fresh-water river as a big fish swims alone there, and this inaugural visual perfectly captures the movie's most important conceit: the idea that we all make ourselves and our lives out to be "big." Sometimes we even do so at the expense of those we love, who risk becoming mere "context" in another person's epic poem. 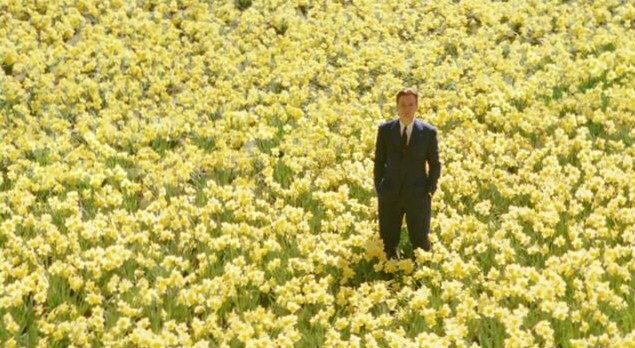 Of all Tim Burton's films, I readily confess that I find Big Fish the most emotional. Maybe because it's a story of fathers and sons learning to understand one another.Perhaps because it concerns the inevitability of death, and the passing of the generations (as well as the storyteller torch). Regardless, I do know that this film hits me on a very personal, very intimate level every time I see it. I had an important person in my life until about a year ago (2010) who was, like the movie's Ed Bloom, a masterful and ridiculous storyteller. He was a man who had (so he claimed...) met and conversed with Colin Powell and Albert Einstein, and who was biologically related both to General Robert E. Lee and Katie Couric. He absolutely never met a fish story he didn't like. The man could put you on with the straightest of straight faces, and in some moments, could even devise for you what your life story should be. This larger-than-life figure spoke in the most idiosyncratic and singular manner I've ever known, replete with lots of extremely colorful metaphors, and he passed away following the sudden onset of a terminal illness. And yet -- in large part because of his incomparable manner of expressing himself and telling his stories -- he remains an everyday voice in my head. Today, he's an indelible fixture there, and sometimes, almost against my will, I still hear his unique voice, and his flamboyant way of communicating. His vocabulary alone -- his bizarre lexicon -- seems often to be on the tip of my tongue. Now, I don't want to romanticize this man and turn him into a saint, because that description does no one any good. e're all but human beings, with flaws and foibles. 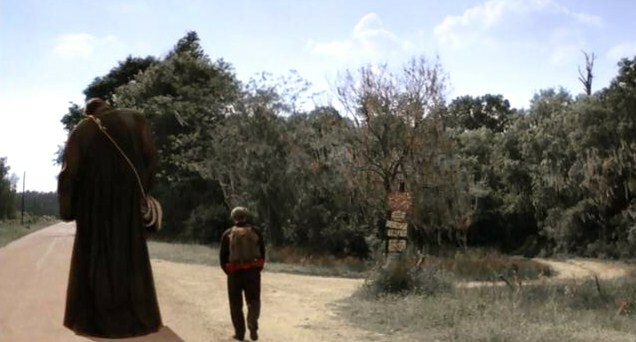 But there was an element in this man -- as there is in Big Fish's Ed Bloom -- that raises questions; that fascinates. He turned his stories into great adventures, all while leaving the real man, the truth itself, opaque. His crazy stories and jokes cloaked...what precisely? So, in one sense, I knew this man and his unique mode of expression deeply for over twenty years, and yet in another very basic sense, I didn't know the real man at all. At least not until I understood the seemingly impossible: that the stories, jokes, and tall tales were the real man. They were part and parcel of his individual and mental gestalt, and you couldn't separate him from those tall tales. I don't usually write here about how films affect me personally. I generally don't like that approach in film criticism, preferring to rely instead on examinations of compositions and leitmotifs, and so on. And yet I can't honestly deny that Big Fish hits me in a close place. It seems so true to my own personal experience that I suppose I have a hard time separating Will Bloom's story from my own experience. What I can declare with conviction is that Big Fish is the most heartfelt and touching of Burton's works. erhaps not the best (a title I reserve for Ed Wood or perhaps Edward Scissorhands), but certainly the most emotional. As Clint Morris wrote of the film in Film Threat: "It takes those oddities and twists that many don’t usually go for if they’re not a big fan of the director and interweaves them into a tale that’s so enriching, so heartwarming, so funny, so touching and so breathtaking, you’ll wonder why the king of wackiness didn’t branch out sooner." And Peter Travers, writing for Rolling Stone, insightfully noted that Burton had finally hooked the one that got away, in the process deepening his "visionary talent." I agree with both those conclusions. If I had to select one Tim Burton film for people who generally don't like Tim Burton films, it would be Big Fish. "It doesn't always make sense and most it never happened..."
Big Fish is the story of Ed and Will Bloom, estranged father and son. Ever since he was a little boy, Will has heard his father tell crazy stories about witches, giants, werewolves, Siamese twins, and mysterious ghost towns. At first, Will believed the stories were wondrous and magical, but over the years he began to wish that his father would drop the fairy tales and just start relating to him as a real person. Now, as an adult, Will learns that his father is on his death bed. He asks his father to tell him one true thing before he dies, but his father insists that his stories are the "truth" about his life. "I've been nothin' but myself since the day I was born, and if you can't see that it's your failin', not mine," he tells his son. Will finds this hard to accept, especially as he prepares to become a father himself for the first time. After Ed relates his life story to Will's wife, his health declines further. On the verge of dying, Ed asks Will --- his only son - to tell him how his story ends. Will complies, and in doing so, gains a new insight into the man who raised him, as well as the importance of storytelling in all our lives. "Dying is the worst thing that's ever happened to me." In some senses, Big Fish is very much about a blowhard, as Roger Ebert suggested in his review of the film. It's uncharitable, but true. Ed may have led a big life, but he also has a big mouth. 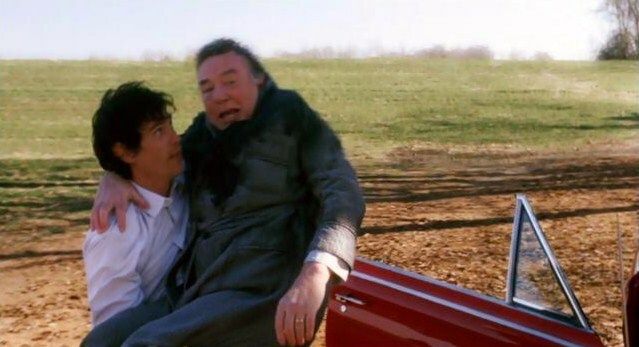 In fact, Ed Bloom (Ewan McGregor/Albert Finney) has so transformed his life into a series of weird and wonderful stories that his grown son, Will (Billy Crudup) isn't sure he even knows his father. That's a terrible thing. And yet the movie ultimately sides with old Ed. He isn't viewed with harshness by Burton. Instead -- in the passing of the generations -- the movie reminds us that each storyteller will have his day. Ed has had his day, and now Will's day looms. At the movie's end, it is Will who tells the "end" of Ed's story, and who recounts for his son a lifetime of adventures. It's important too, that Ed is never portrayed as a liar. Instead, as his funeral reveals, he is just a serial exaggerator: one with a foot in fact, and another in colorful fiction. By Ed's reckoning, Will tells stories with "all the facts, none of the flavor," and that's just not his way. Some reviewers have been hard on Big Fish, noting that it never really considers the son's point of view or feelings. There may be some truth to this perspective, but in the final analysis, Big Fish does right by both characters. We follow Ed from birth to childhood illness, from his first love to, ultimately, his death. In Ed's life story, we readily detect his spring and summer (his youth), and even his autumn and winter (his old age and demise). Notably, Burton makes certain that the natural landscape echoes each one of these spans. As a young man, for instance, Ed sees Spectre as a beautiful, idyllic town, well-painted and carpeted in lush green grass. As a middle-aged man, however, Ed returns to the town and finds it paved over, browning, and in a state of decay. You can't go home again. Similarly, when Ed courts the love of his life, their romantic love is expressed in the vibrant yellow of endless daffodils. As death approaches, such blooming (and remember his name is Ed Bloom...) has ended, and all the trees are stark and naked, bereft of leaves. Winter has come for Ed at last. Will certainly represents an important chapter in Ed's life, but in a sense, his "part" of the story only really becomes important in the closing chapters. Ed can't write his final sentences himself. That's why he needs his boy. Ironically, it is to contextualize his life, not vice-versa as Will initially feared. And really, that's always the job of those left to carry on after losing a parent: to put the actions and span of the dead into some kind of meaningful order. As it turns out, Ed's strange stories become important to Will. They represent the old man's legacy and gift, a colorful way of looking at the world and remembering Dad. Ed wanted Will to listen to his stories for a reason, and not merely to entertain him. Someday, the boy would need to know the details so he could take ownership of Ed's story and continue it for the next generation. Again, this is as much about Will as it is about Ed. In life, we are all part of this cycle. We all heirs to a story, caretakers of that story, and then givers of the story -- after we've had it and protected it for a lifetime. Big Fish gets at this idea in a more beautiful and imaginative fashion than just about any movie I've seen. The imagery is enormously affecting, particularly as the strong, healthy Will picks up his infirm, dying father and lifts him into the air -- as if carrying him like a baby -- for one last adventure, one final tall tale. There's something so innocent and beautiful about this image. The boy who was once held by his father's strong arms now lifts up his sick dad -- negating the realities of gravity -- and cares for him as he was once cared for. This image gets me every time: the son becomes the father; the father the son. The roles reverse, and time marches on. Big Fish offers other narrative and visual glories as well. I love the use to which director Burton puts Helena Bonham Carter here, essentially making her every "other" woman figure in Bloom's life. She is both a terrifying (if friendly...) witch and a young, innocent girl, all grown up. And I also appreciate another powerful image: one of a fork in the road that seems to literalize the Robert Frost poem about the road taken and the road not taken. Again, this fits in well with the story's meditation on the seasons of life, and the choices we make. Our destiny is sometimes as simple as deciding which path to follow. Big Fish is filled with incredibly whimsy and magic, and yet, at the same time, the film seems to truly capture something essential about our mortality, and the mortality of those we love. We can view tall tales as merely "amusing lies" from someone we love, or as the seeds of immortality itself, a renewable source of energy that we can share with our children and our grandchildren. I wrote above about the man in my life who was a lot like Ed Bloom, right down to his southern heritage He saw Big Fish back in 2004 and loved it. He especially loved that Bloom's stories were ultimately validated...that there was a degree of truth in his musings about giants and witches and werewolves, and so on. I get that now. In understanding our own lives, the stories we tell do become true to us, at least after a fashion. It may be "impossible to separate fact from fiction, the man from the myth," but when you meet a storyteller of such caliber, you never forget his words...or his life. It doesn't always make sense and "most of it never happened... but that's what kind of story this is." I'm glad that Burton decided to tell it. But damn...it makes me weep. It makes me want to hold my son. A review as wonderful and heartfelt as the film itself. Incredible piece of writing, John. Honestly, I've seen a lot of the Burton films and Ed Wood and this one, especially this one, were films I always wanted to see, perhaps more than the others I've seen. Based on all of the things you've offered regarding the film, I must remedy this oversight. I always thought their were other fish in the sea or Bigger Fish to fry, but clearly I was mistaken. Look forward to seeing this one. I'm with Chris H. on this, John. You've written a wonderful yet personal examination of this film. 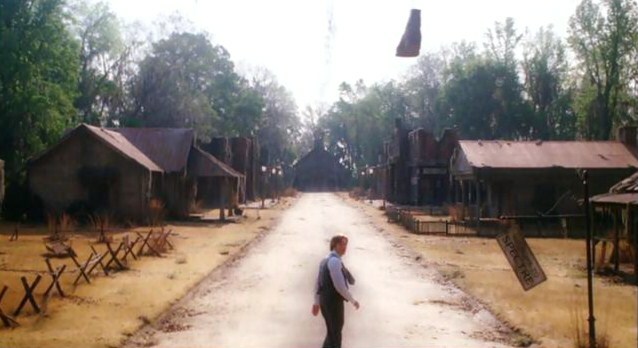 For me, 'Big Fish' is the most earth-bound of Burton's films, I think. Even if there is a bit of the fantastic and visual in it (as one would expect), it's one where I feel the passing of time the most. Where 'Edward Scissorhands' has a sense of timelessness to it, and 'Sleepy Hollow' seems to capture a moment on the precipice of change (and a new century), this film has the quality of inevitably to it. I agree with you, too, that it remains the most approachable for those not into Tim Burton. The other thing I've become aware of with BF is the shift of father to son. Not the obvious one in the film. You see, my relationship with my own father was never close, so the split between them (as the father and son dynamic can do) and their re-joining didn't resonate as much. It was harder for me to identify with Billy Crudup's character. Then, I came to realize I never would (as me as son to my dad). It's Ed (Albert Finney) and his life (including that magical spark he has with his wife) that holds the connection, with me then as the dad hopefully somehow holding on to my relationship to my son. Then, the story comes to mean a whole lot more for me as viewer and father. I think I understand your endearment of this film, and its indirect bond to the loved ones in your life. For all that, please hold that child of yours a bit closer, my friend. I think this is one of your special looks at a cinematic work, John. It certainly resonates. Thanks for this. Thank you all for the great comments on Big Fish. Chris: Your words mean a lot to me, my friend. I'm glad you enjoyed the review and felt it did the film justice. 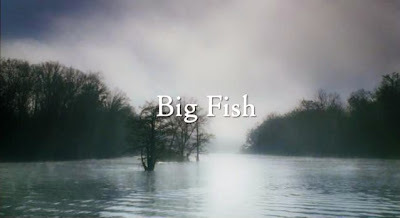 SFF: Being the family man I know you are, I think you would really enjoy Big Fish. It has the whimsy of the best Tim Burton films, but also a real, emotional through-line. Le0pard13: I agree with you very much that Big Fish seems a bit more earthbound than many Burton films, and that the passage of time is a big issue here; that sense of "inevitability" that you mention. That's what I get from the movie too: the sense of seasons passing; of a life, fully lived from start to finish. I find it enormously affecting. Thank you so much for that great honor. I truly appreciate the recommendation, and the kind words you wrote about this retrospective.